Ever since writing an artist profile of Danielle Ate The Sandwich and selecting When Our Parents Die as the feature video, I’ve had that tune stuck in my head. It’s such a simple, catchy and peaceful tune. As I often do with songs stuck in my head, I decided to work it out on the ukulele. This one was a bit of a challenge since the notes she sings, especially that low one during the verses, are hard to fit into a ukulele arrangement. 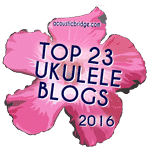 The song also has a really big range – it goes from 1 note above the lowest note on the ukulele up to a several notes below the highest. I’m very pleased with the result though, and hope it has retained the spare, thoughtful feel of the original. Enjoy!